Protect your iPhone 7 with this durable and stylish black leather-style wallet case from Olixar, featuring two card slots. What's more, this case transforms into a handy stand to view media. I never write a review, but this time I have to. This smart elegant iPhone case just right. The size is perfect, enough to carry in your purse or just alone. I wanted a slimline plain wallet for my iPhone 7. Exactly what I was looking for. Good quality, good price, arrived quickly. Will def order in the future. One card held in wallet and has split already. Very happy with the product, though the tab attached at the side goes from front to back rather than the usual type, which makes it a bit different. Searched online and found the item with ease. Cover is functional and just what was needed. I had purchased a leather case for my iPhone 6 and I knew what to expect when I ordered one for the 7. It arrived in good time and the phone fitted perfectly. Would recommend this product every time and it gives good protection should you drop your phone. This Iphone 7 case is very good value for money and does protect the phone well. This case is OK for using as phone stand and similar but its Leather Style and when I got it out of the packet it really smelled terrible. I left it to air it out and it took 2 full days to get rid of the smell. For this particular brand I think its unusual to smell that bad. I have had same brand for other phones and they've been fine. The case is good to charge the phone using an iq wireless charger pad and everything seems to line up ok. I would not recommend removing this case too many times because the places where the holes are for the button access are flimsy on the edge and may break easily (past experience), but if you leave the phone in the case then its fine. It gives adequate protection for the phone and is better than not having a case as the phone has a tendency to move of its own doing - often falling on the floor (risky!!!) The case stops that. Good product very happy with it. Phone case was in perfect condition for a few days then the fabric on the left side where the cards slot in started coming away at the corner. The fabric itself is thin and cheap and has stretched out so that if I tip the phone case down the cards fall out, I’m constantly having to pick the cards up and therefore am already having to look for a new phone case before I end up losing a card. Nowhere near the standard I would have expected and would definitely advise anyone against purchasing if you intend to actually store your cards in it. Completely unfit for purpose. Item arrived in good time, it’s a present so I can’t comment on how long the item lasts as I haven’t given it to the person yet but it looks of good quality. High impact plastic cradle that retains the phone. All the cut outs are in the right locations so all the side buttons are accessible. 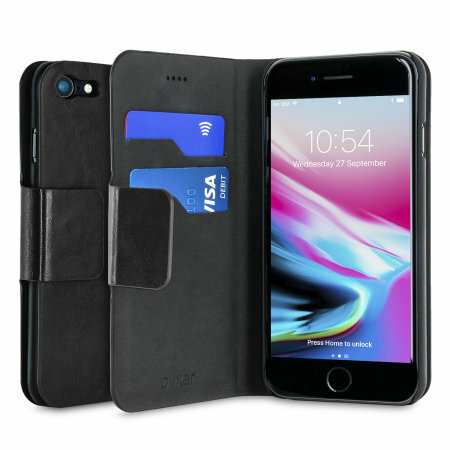 Luxurious leather look outer cover flips over with a magnetic tan that keeps it all together, oh did I mention the card slots on the inner left leaf. I put my lottery ticket in there but could be train or debit card. Looked for a cover for my new iPhone 7, Found this - liked it- ordered it and it came. Whats not to like? Excellent service all round . I've had this case for over a month now and have to say I wish I paid the extra $10 for the leather version. The card slots have become incredibly loose (causing cards to fall out on more than one occasion), the sides have split and the plastic part of the case has cracked on both of the top edges as well as the part that covers the volume control. All this was caused from what I would call usual wear and tear so I wouldn't recommend it if you want a durable case that lasts. Worth the money spent on it. Fits great good quality.